James Ramsey Murray (1841-1905) was born in Ballardvale to a family of skilled Scottish craftsmen. His father Walter Murray was reportedly the first spinner in the Ballardvale Mill in 1836. The younger Murray worked as a teen for rubber cement manufacturer Henry Tyer, but after suffering a severe illness, took the advice of Ballardvale’s Rev. 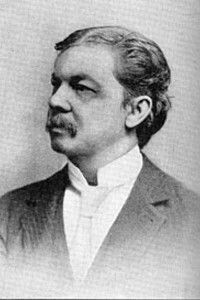 Henry S. Greene, from whom he received music instruction, to devote his life to the musical profession. He studied at the Musical Institute in North Reading with renowned music teachers including George Root. Murray enlisted in December 1861 as a musician in the Massachusetts 28thInfantry, but transferred in the summer of 1862, when regimental bands were discontinued, to Andover’s Company H. He had likely written songs before the War – the Andover Advertiser printed his lyrical poem “Go!” dedicated to the “Andover boys of the 14th and 19th regiments” in August 1861. His most successful composition of the war years, “Daisy Deane,” a collaboration with his cousin Thomas Winthrop of the 19th Regiment, was written in a Virginia camp. The weepy ballad was published by Chicago’s Root & Cady in 1863 and became one of the biggest hits of the war years. After the war, Murray taught piano and singing in Andover before accepting a position with Root & Cady. He returned to Andover in 1871, after Chicago’s Great Fire, but moved permanently to Cincinnati in 1881. He published many songs and hymns, most notably the Christmas carol “Away in a Manger” in 1887.